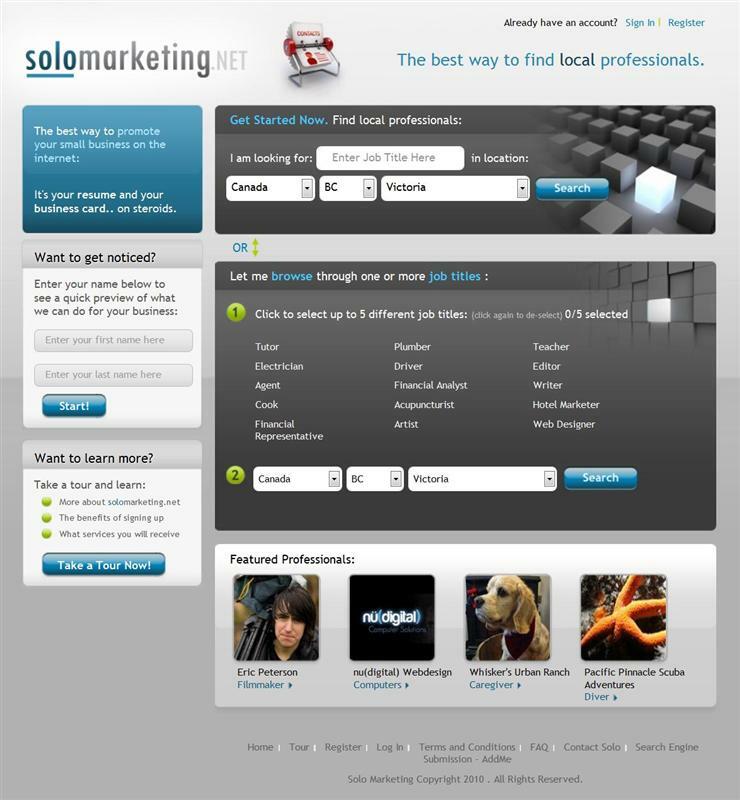 SoloMarketing offers a unique solution for small businesses, or private service providers, to effectively market themselves by creating an online presence. 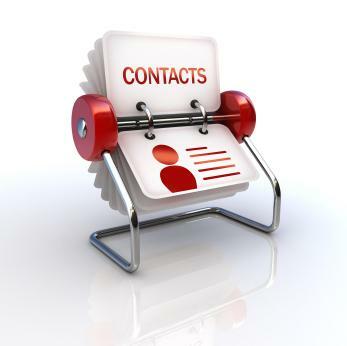 Members may create visual profiles which support basic administrative duties and promotional efforts: invoicing, bill management, client contact registry, online marketing, profile upgrading, etc. This powerful marketing tool can be identified as one of the strongest advantages to being a SoloMarketing member. While signed-in, under My Achievements, members are encouraged to complete up to ten easy yet extremely effective marketing efforts. These ten step-by-step narrated videos walk members through the process of ‘virtual profile distribution’. 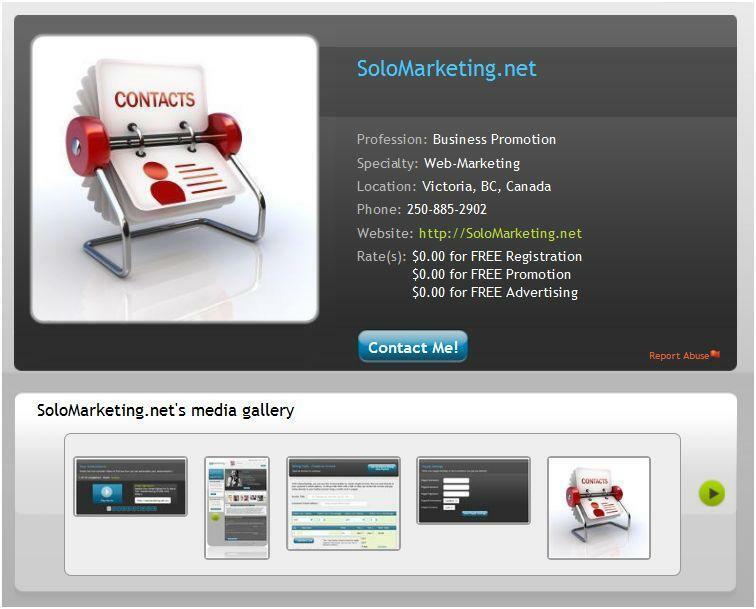 Your SoloMarketing profile is your innovative virtual business card. As each new step is completed, your Ranking improves in standing. However, more importantly, each effort is charted below on a graph which shows the number of hits to your profile per day and per achievement via your tracking URL. This URL accompanies each marketing step and directs clients to your profile while simultaneously recording new analytic data for you to monitor. Photo management is very fast and very simply – click ‘BROWSE’ for picture, then ‘SUBMIT’ and you’re done! If you wish to add text, you may type a maximum of 150-characters per caption per image which may include information about a product, service, name, price, or general description. For our member’s clients, it is inviting and effortless; images are displayed beautifully using exposé. 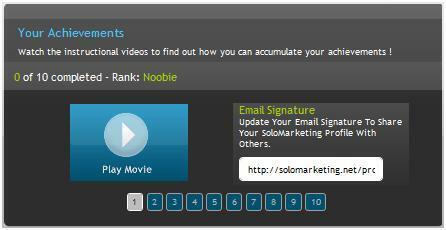 The video manager, again, is beautifully simple – just ‘COPY-PASTE’ the embed code, add a caption if needed, and ‘ADD’. That’s it! 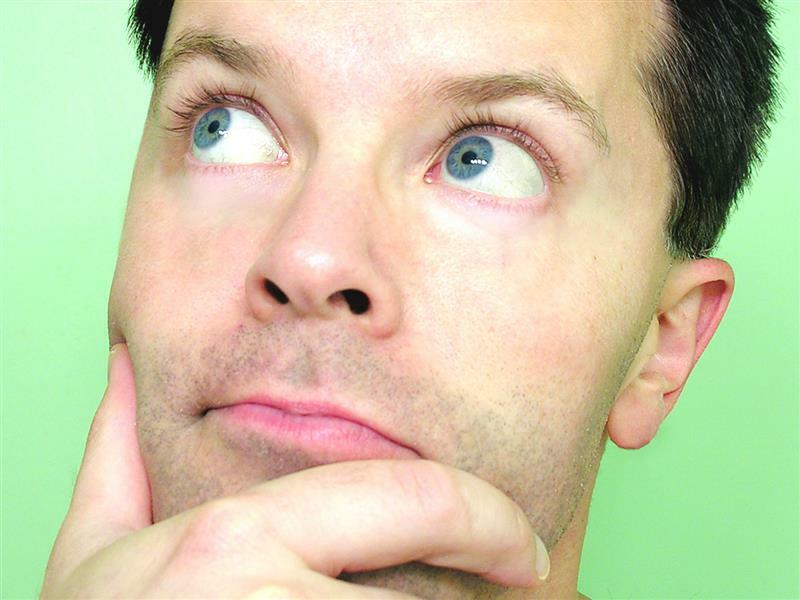 If members are not so tech savvy, a link to an instructional video on how to upload a video is available. Images and video are located in the member’s media gallery. Members may display up to five tabs which can contain little or even up to many pages of text. Tabs may be labelled to fit each member’s needs: some common tab headers may include: ABOUT ME, POLICY, RESUME, RATES, TESTIMONIALS, OFFERS, FAQ, SPECIALTIES, PRODUCTS, SERVICES, etc. These tabs can easily be shuffled through and viewed simply by clicking on each tab. While editing these tabs, members have the option to select design mode which supports a variety of stylising tools, preview mode, or HTML mode which shows the HTML text for hyperlinks. The powerful text editor even allows for tables to be copy-pasted inside tabs. Very user-friendly and walk-through invoice creator, wow! Here, members can fill out our invoicing template to bill clients directly to client email with great ease. Members simply need to add an Invoice Title, the Customer’s Email Address, any additional information as a footer, and of course the saleable items with taxes if applicable. Members can Add New Lines when more than one product or service is being calculated. Furthermore, all invoices can later be viewed, edited, marked as paid, or deleted. SoloMarketing allows members the option to set up Paypal so that clients can make quick-and-easy secured payments online. Allowing clients to use credit payments through this method can open up business to long-distance sales and to clients who prefer more secured methods of payment. It will take off in a big way! 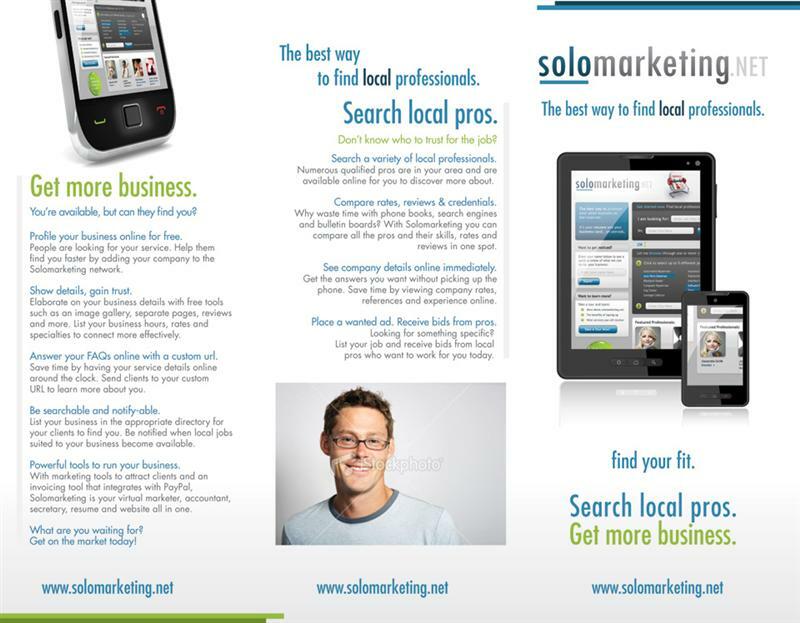 SoloMarketing.net is really an eye catching website and it’s an easy way for local professionals to promote themselves. A real strong point is that there are no fees involved in this service and this alone will make it stand out. I can really see myself using this website. 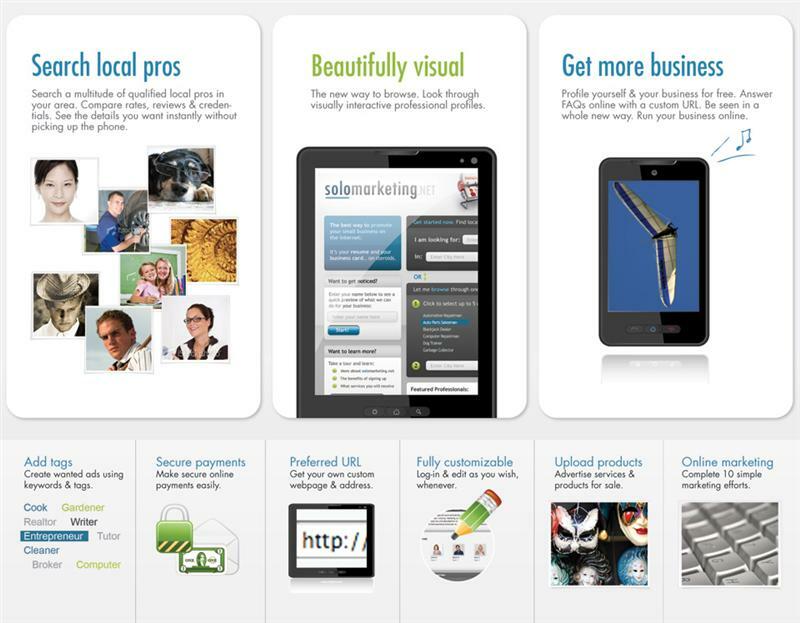 It's extremely easy to use and it's just loaded with features and is so customisable. I don't think anything else compares; and nothing can beat being free! Hats off to you guys. I really like the look and feel of your website. 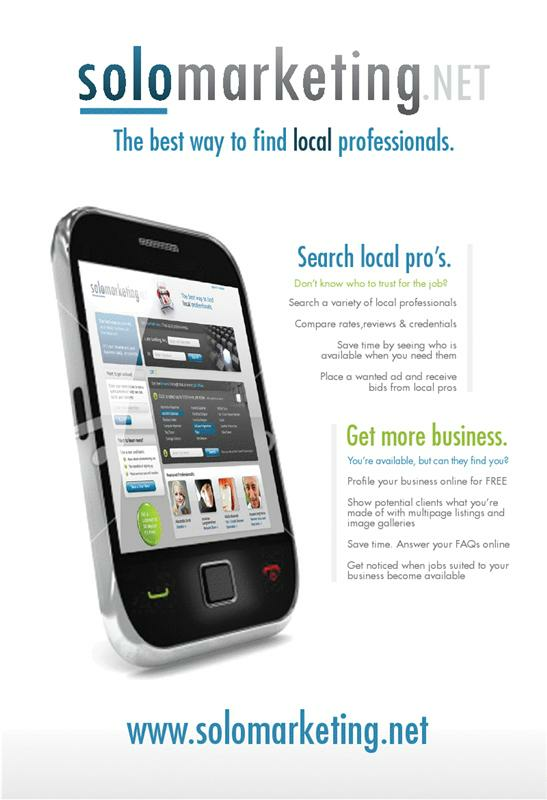 The professionalism of your site really reflects the quality of my services which is really important for me.